Jumpin' Jesus on a Pogo Stick WTF is That? 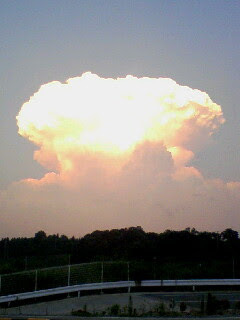 Is what I thought as I exited AEON the other day and was confronted with what looked exactly like a mushroom cloud. It took up half the sky and was truly a sight to behold. Of course I hurried to take a pic, as did several other people in the parking lot. Very creepy. Anyway sorry for not updating much, I'll try to be more diligent! PS I put up a new post on Let's Signing! too.